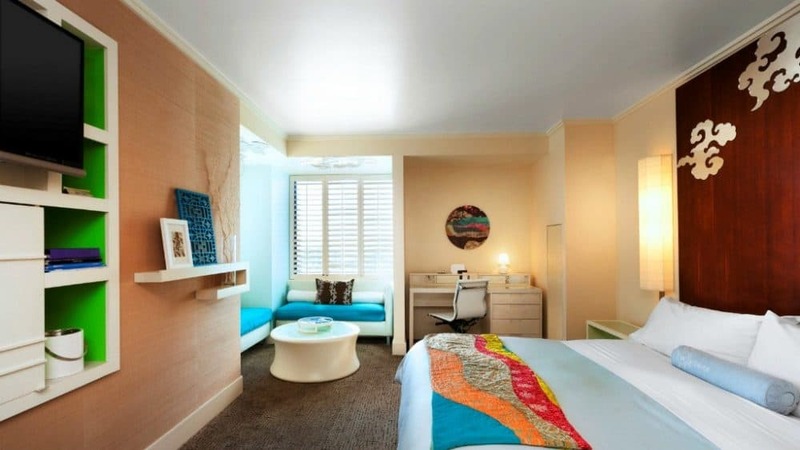 Flamboyant and daringly designed, a stay at the popular and highly rated boutique Hotel Triton is anything but dull. 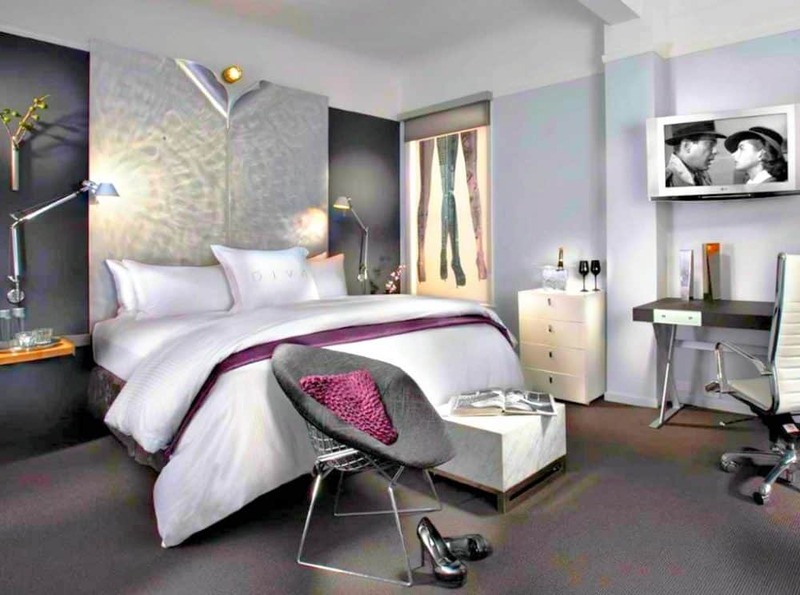 Located in the heart of the city (opposite the Chinatown Gate and only a five-minute walk from all the hustle and bustle of Union Square), from the moment you step into the lobby you’ll enter a surreal world filled with tomato soup-coloured walls, purple boudoir style furniture and even cute rubber ducks residing in the bathtub – now that attention to detail! 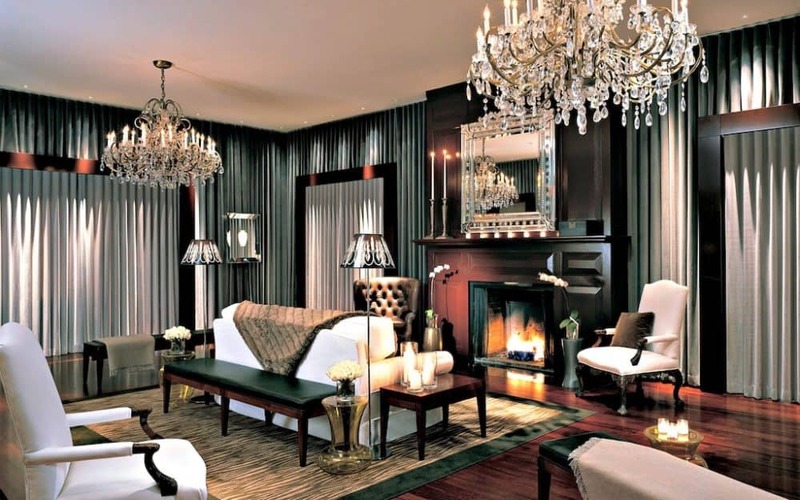 With its tireless dedication to creativity, this hip San Francisco hotel has even allowed celebrities – such as comedienne Kathy Griffin and Grateful Dead musician Jerry Garcia – to design a few of their suites. 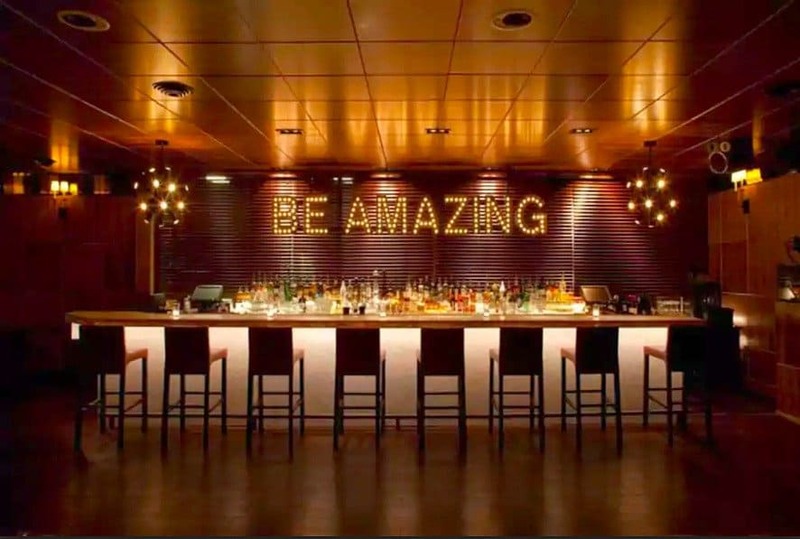 As well as free Wi-Fi, use of yoga mats, in-room spa treatments and a daily wine hour, Hotel Triton is also known for its hosting of unusual events ranging from nightly tarot card readings to drag queen shows taking place in the lobby – just fabulous darling! Prices from $100 a night. 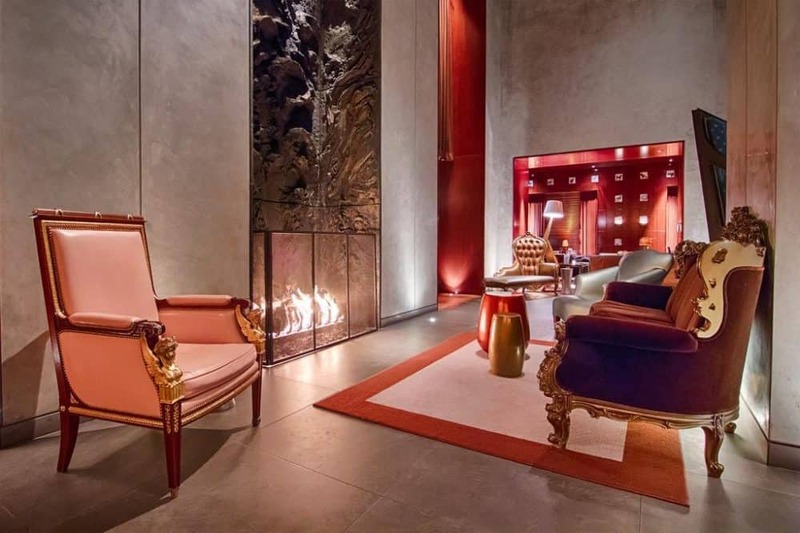 This 4-star exceptionally rated luxury boutique hotel has seen all the coolest magazines falling over themselves to name as one of the best-designed hotels in America. Bright, colourful, arty with enough eccentricity to keep things interesting, the designers definitely haven’t held back here! With a fabulous fusion of the old and new, centrally located Hotel Zetta is housed in a refined neoclassical building but the inside has been completely renovated to feature a clever mix of modern design with plenty of classic and arty details – think reclaimed wood and salvaged antiques sitting alongside swanky modernist sofas and chairs. With a more than a little hint of fun, there’s even a two-story Plinko game in the lobby and a second-floor lounge that features billiards and shuffle-puck tables. 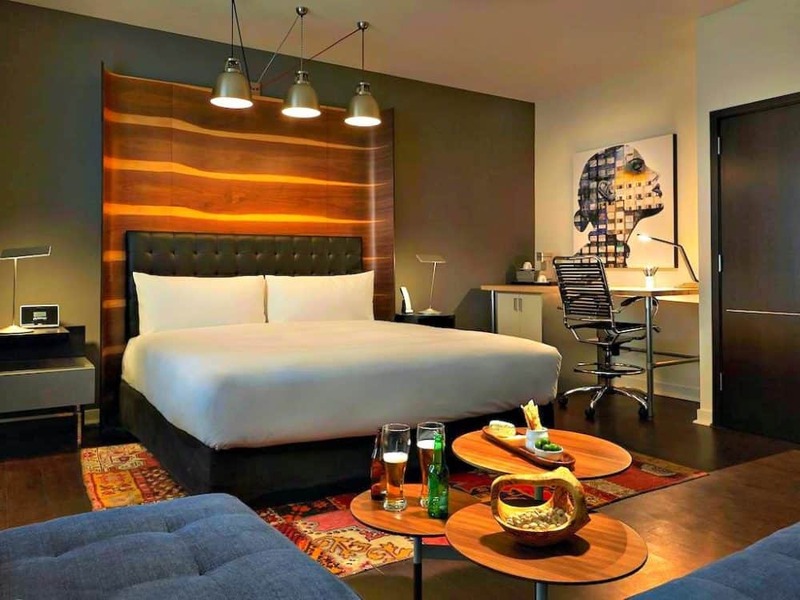 Located only a 9 minutes’ walk from buzzy Union Square and a 3-minute walk from the Powell Street cable-car and BART rail station, this is a great choice for a hip hotel which combines high-tech lodging with artsy touches. 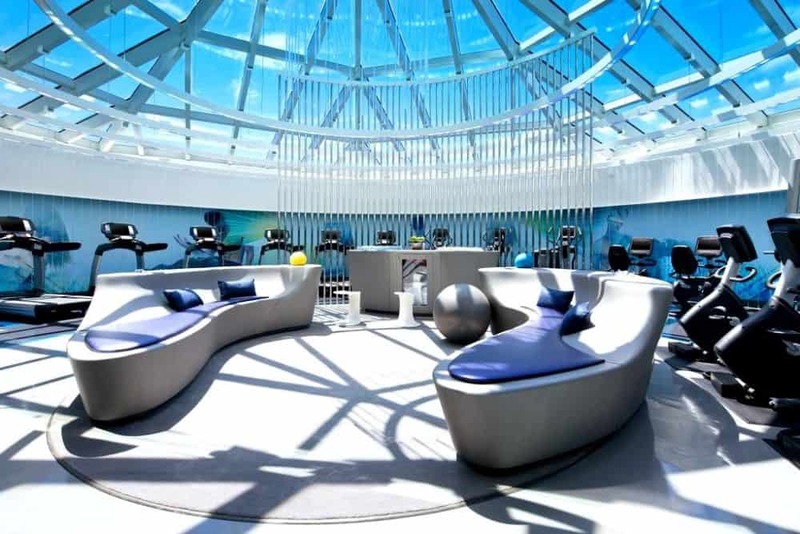 Also expect a free weekly yoga class, in-room spa services, smart TVs and games consoles and a 24-hour fitness centre – we’ll guarantee you’ll fall in love with this funky and chic San Francisco abode! 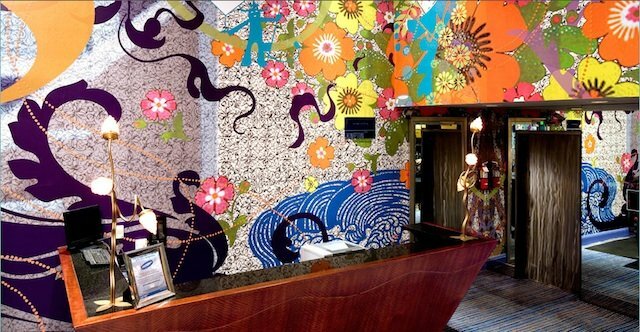 Hmm…it’s tough trying to describe this cool San Francisco hotel but I think that’s the intention of its designers! It’s at once kitschy, hip, futuristic and historical… in parts, it reminded me of a sci-fi film made in the 1960’s, in others a very clean and swish Frat house and finally a luxurious spa hotel! 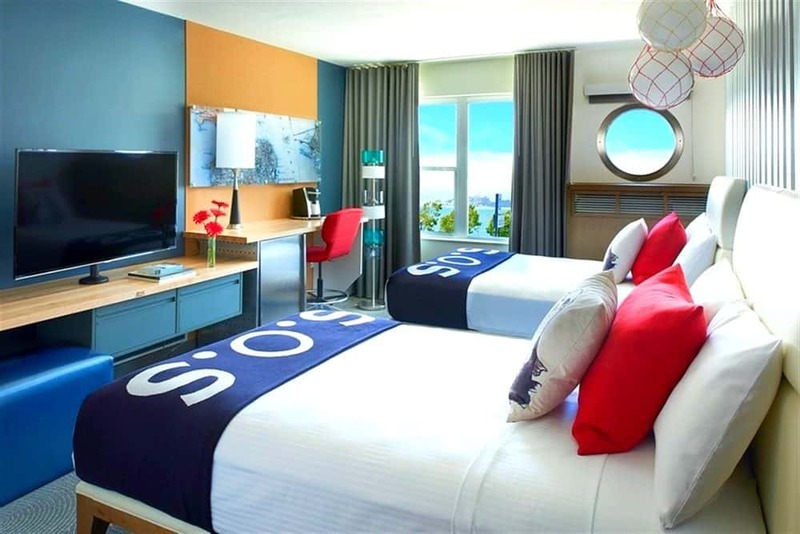 The 4-star and exceptionally rated Hotel Zeppelin is a beautiful mash-up of lots of styles and ideas that celebrate the cultural melting pot that is San Francisco, my room, for example, was a gorgeous melange of 1960’s colours with lots of contemporary twists. It featured vintage turntables, vinyl records and funky artwork as well as Wi-Fi, flat-screen TVs and minibars. Suites and upgraded rooms feature unique touches such as fireplaces, kitchenettes and some have gorgeous outdoor decks. Overall it was comfy as well as being trendy and a huge bonus was that it was set in the upscale Nob Hill neighbourhood right in the centre of the city, just minutes from Union Square (and a 2 minutes’ walk from the nearest cable car stop which will take you all over the city). The service was outstanding and nothing was too much of an ask – all in all, just a fabulous, unique and unusual place to stay in San Francisco! Otherwise known as the Rock’n’Roll hotel, this 1950’s style retro motor lodge is said to be where the likes of Little Richard, The Red Hot Chili Peppers and Radiohead stay when they are in town. This funky oasis enjoys a very hip location on the edge of San Francisco’s trendy Tenderloin district (only a 10-minute walk from to BART rail station which will take you to the rest of the city), the classic hotel combines frozen-in-time kitsch with a super caring ethos – they donate a percentage of their profits to local charities for example. This ultra-hip San Francisco hotel is set around a lush retro motel-style courtyard, the funky rooms and suites offer mod cons like free Wi-Fi, flat-screen TVs and minifridges and other hotel highlights include free passes to a nearby Japanese-style bathing facility, a seriously hip restaurant and a poolside lounge serving seasonal fare and creative cocktails. 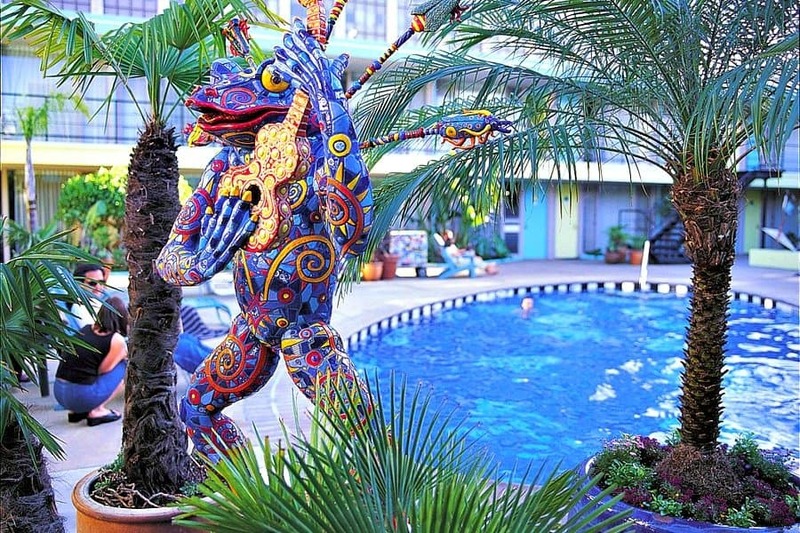 Fun is always high on the agenda at the Phoenix hotel and expect to see colourful murals peeking out from the bottom of the pool, quirky statues lining the courtyards and bedrooms adorned with retro seventies bedspreads and fabulous original artwork – a very cool place indeed! 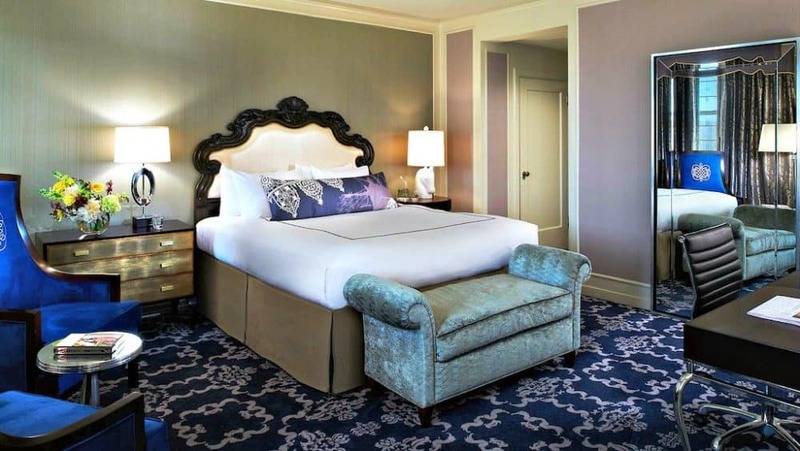 This famous San Francisco institution of a hotel is a delicious fusion of luxury, history and high art with pieces by Dali and Roberto Matta rubbing shoulders with traditional Eames chairs and a whimsical design by Phillipe Starck throughout. 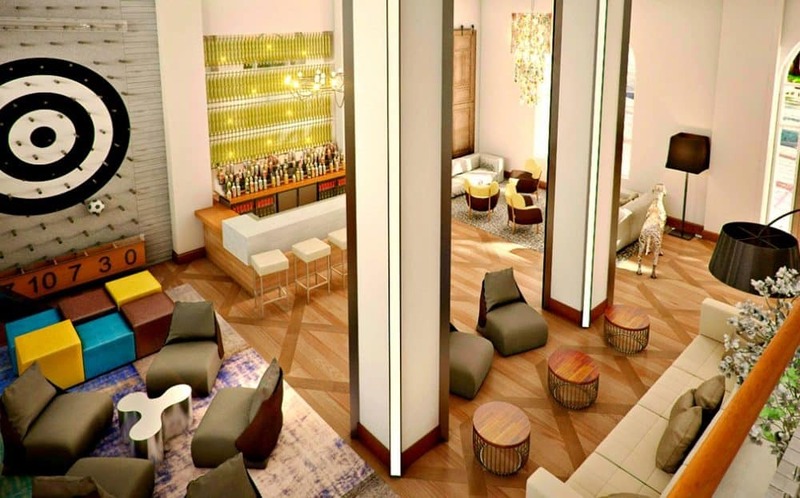 Located a 6-minute walk from all the upscale shopping at Union Square and 4 minutes’ walk from a Muni Metro station, the much loved and highly rated Hotel Clift is eye-grabbing, to say the least! I especially enjoyed a signature cocktail in the beautifully restored wood-panelled Redwood Bar which featured velvet sofas and conjured up images of the long-ago jazz era, flapper dresses and a morose saxophone player briefly visible amidst clouds of cigarette smoke. Now, of course, there is no smoke and the saxophone has been replaced by music curated by local DJ’s – Thursday to Saturday it draws in world-talent too and a steady crowd of revellers follow. My room at this trendsetting San Francisco accommodation was gorgeous, calm and comfortable with custom-made furniture and the finest quality linens and a beautiful view of the city out my window. Location-wise it was perfect – if I jumped on a streetcar up Geary, I got to the rugged coast and ruins of Sutra Baths, if I went in the other direction I soon hit downtown and the financial district and eventually the Bay. 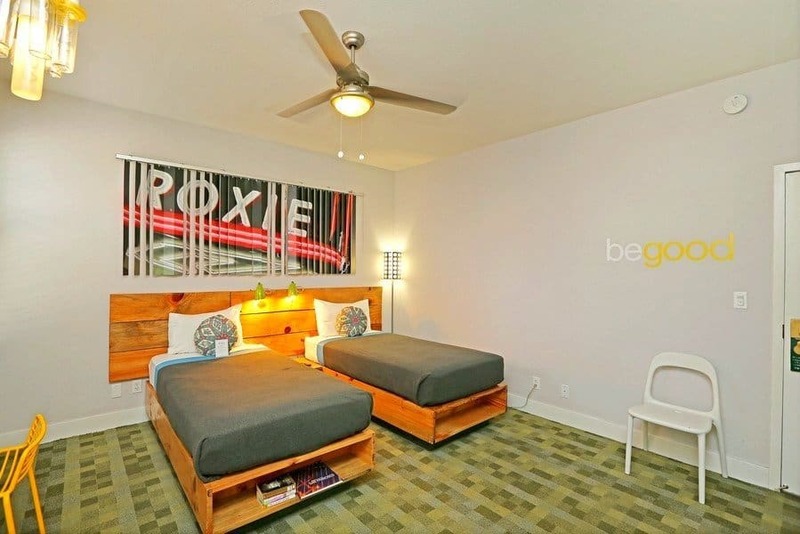 An absolutely wonderful place to stay in San Francisco to experience the beautiful bohemian soul of the city with all the sumptuous modern comforts and that you need in life! Hotel Zephyr is right bang smack in the middle of the popular tourist haunt of Fishermans Wharf (5 miles from the Golden Gate Bridge) but this no ordinary tourist trap! 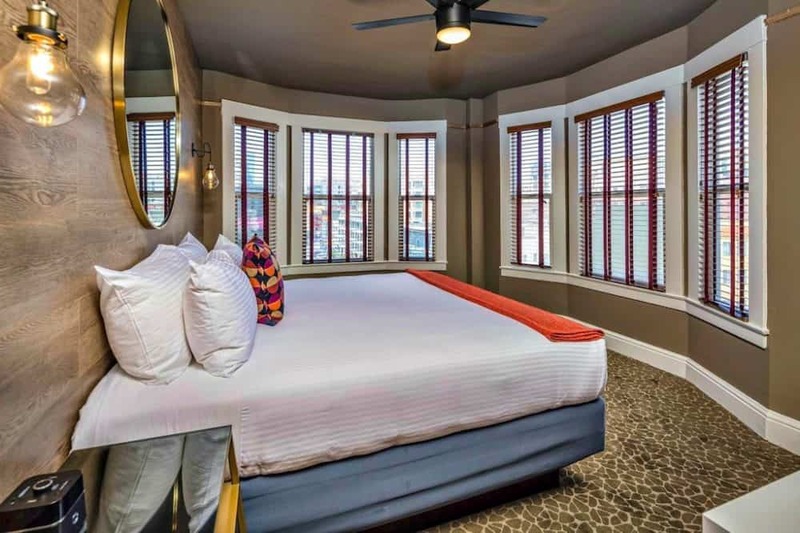 It is, in fact, an upscale and highly regarded boutique hotel that celebrates the industrial maritime heritage of the city and throws in plenty of fun too. As a former hosteller, I loved this place because it’s laid out to encourage interactions, from the cool outdoor courtyard complete with a fire pit, seating and sculptures, a fun food truck and giant board games to the quirky yet luxurious lobby complete with portholes and furniture made from old dock signs – wonderful! The trendy San Francisco accommodation is bright and comfortable too and there are loads of nice little touches that make it unique…for example, alongside the usual smart TV I spotted backgammon and chess in my room as well as a balcony offering fabulous views over the Wharf. Opt for a suite and you’ll also find floor-to-ceiling windows and other amenities include a colourful gym and free parking. 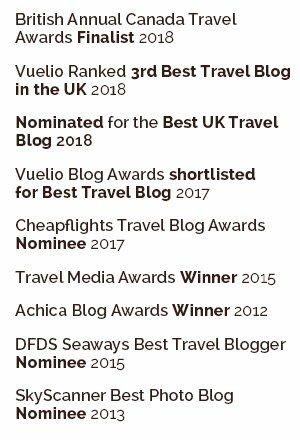 This place is cheeky, quirky and fun but also uncompromising in comfort – for seafarers and landlubbers alike, I would recommend it wholeheartedly! Prices from $130 a night. 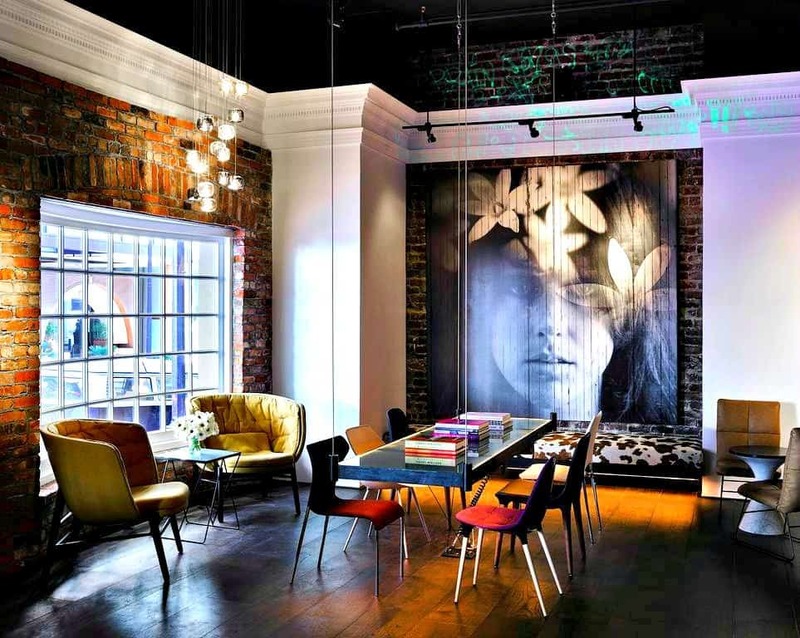 The fun and funky 4-star Yotel San Francisco is the fourth hotel in the chain and has just opened in 2018 following the refurbishment of a historic building on Market Street. 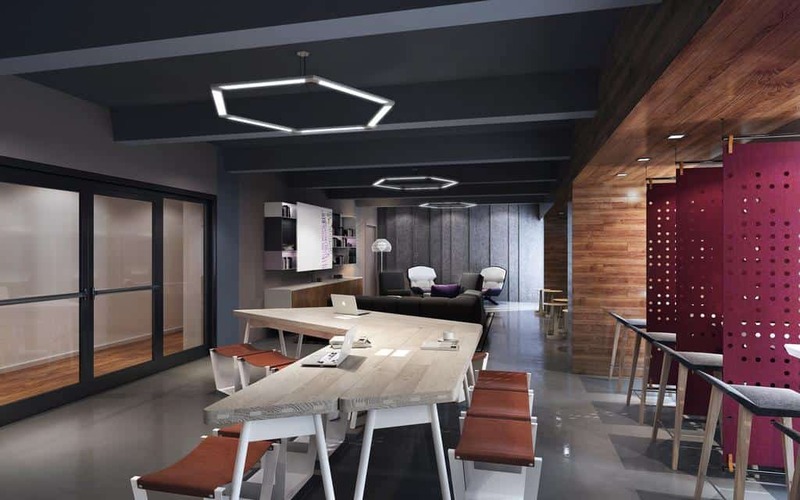 The highly rated hotel is one that is great for tourists but also for people who are on a working holiday with co-working areas and space for meetings and gatherings. The views from the hotel are top quality across Union Square at the heart of the city with the building originally being known as the Grant Building – one that survived the earthquake of 1905. 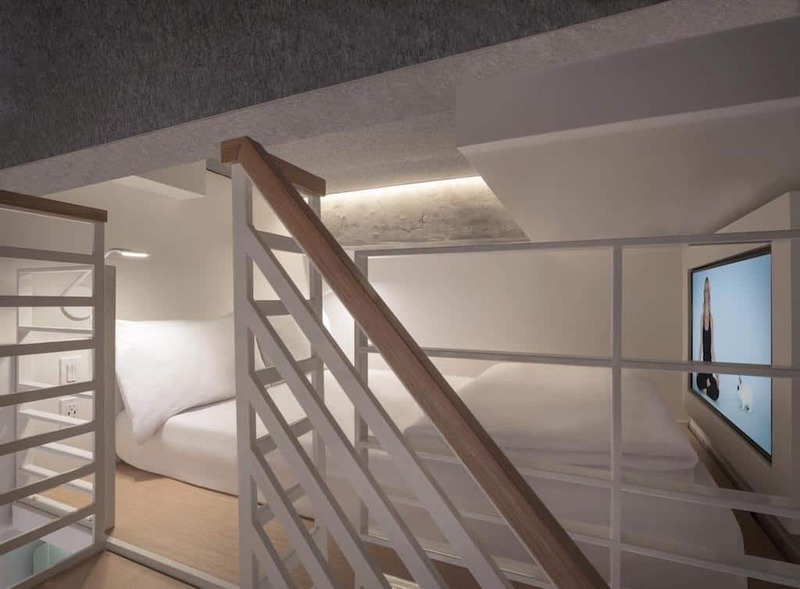 Rooms have a ‘cabin’ style including some with mezzanine sleeping space while there is also a rooftop terrace and bar which offer 360 degrees of the city – a great choice for a unique and cool stay in San Francisco. Marketed as a hotel for guests with a big personality, the 4-star Hotel Diva is a highly rated modern boutique hotel with a sleek, tongue-in-cheek provocative design. 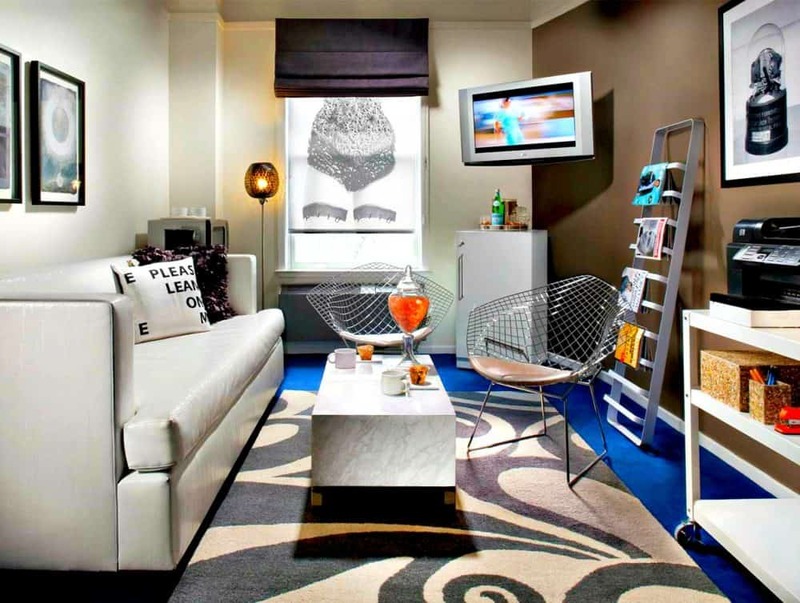 Definitely one of the hipper hotels in San Francisco, expect a steel-and-glass exterior and equally funky interiors like bright cobalt blue carpets, sculpted stainless steel headboards, luxury bed linens to slumber on and even a fabulous ‘diva’ walk of fame which features signatures of past celebrity guests! Located just two blocks away from central Union Square (across the street from the American Conservatory Theatre and only a 3 minute walk to a Cable Car stop), the pet-friendly hotel also features fabulously funky rooms with all mod cons, a cool Mexican bistro, a free evening sake hour, an exercise room, no less than four individually decorated lounging areas and attentive staff who aim to cater to all your diva demands. We promise you, this place is anything but dull! 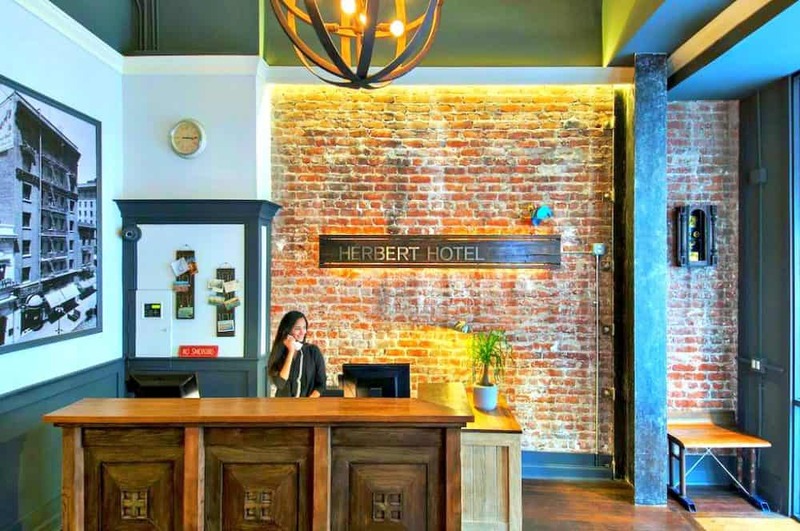 Originally established as a clubhouse by an eccentric timber merchant in 1909, the highly rated and very popular The Herbert Hotel aims to be a warm, welcoming and characterful home away from home for adventurous travellers on a lower to mid-range budget. If you opt for the economy room you can save money by sharing a bathroom but other rooms have en-suites, if you yearn for a little more privacy. All the rooms at this trendy San Francisco abode offer cool exposed brick walls, some funky boho touches as well as flat-screen TVs and free Wi-Fi. 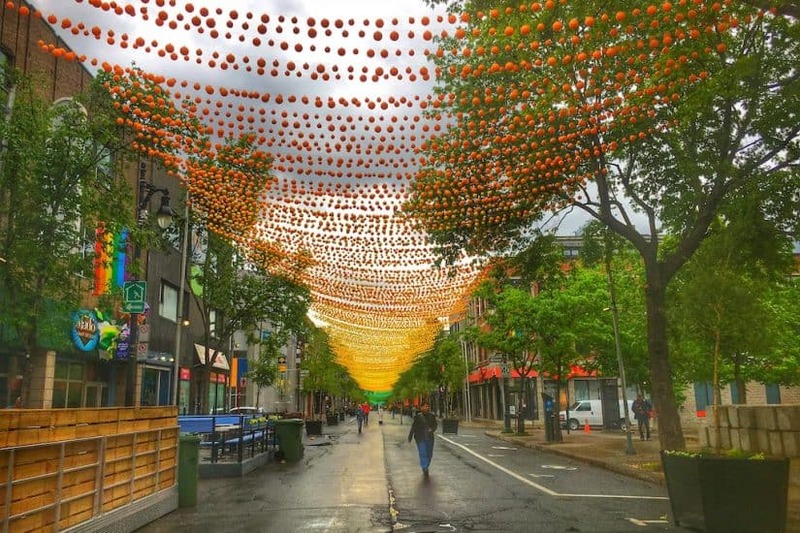 Its location is pretty fabulous too and is only a 4-minute walk from all the liveliness of Union Square and its also located along the Powell-Hyde cable car line which will take you all over the city. You’ll also love the chilled lobby which is adorned with photos and memorabilia from the property’s early clubhouse days – nostalgic and wonderful! Centrally located Hotel Rex is a much-loved boutique hotel which perfectly captures the glamour of the 1920’s. The historic building – which is located only a 3-minute walk from all the shops, restaurants and theatres of Union Square – was painstakingly restored to give the feel of an art and literary salon from San Francisco’s past. With dark wood interiors, period furniture and a large collection of interesting object, including antique books and local art, The Rex succeeds in creating a stylish old-school atmosphere that you won’t want to leave! 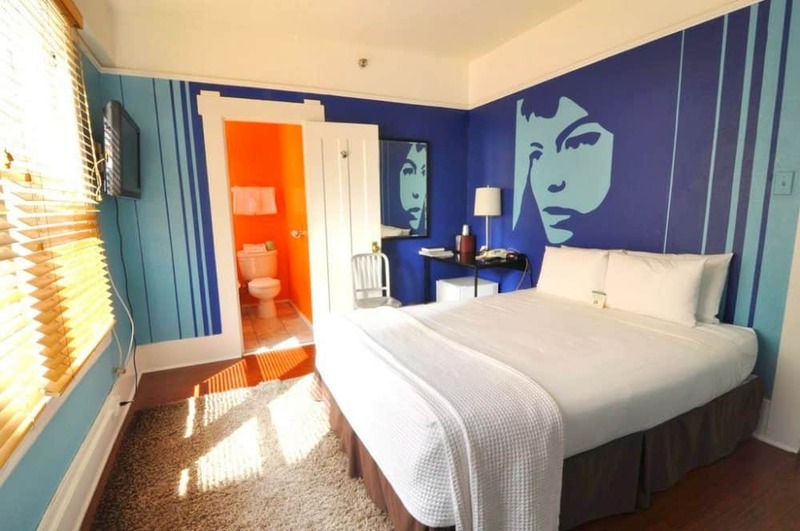 The rooms at this quirky San Francisco accommodation are chic and spacious with custom wall coverings, hand-painted lampshades and an excellent range of modern amenities including flat-screen TVs and free WiFi. Other very cool touches include a free nightly wine hour, a library-themed bar offers cocktails, a club style lounge with convertible billiards table, weekly arts events and live jazz and random poetry readings at their popular on-site Café Andrée, a pretty special great all rounder! 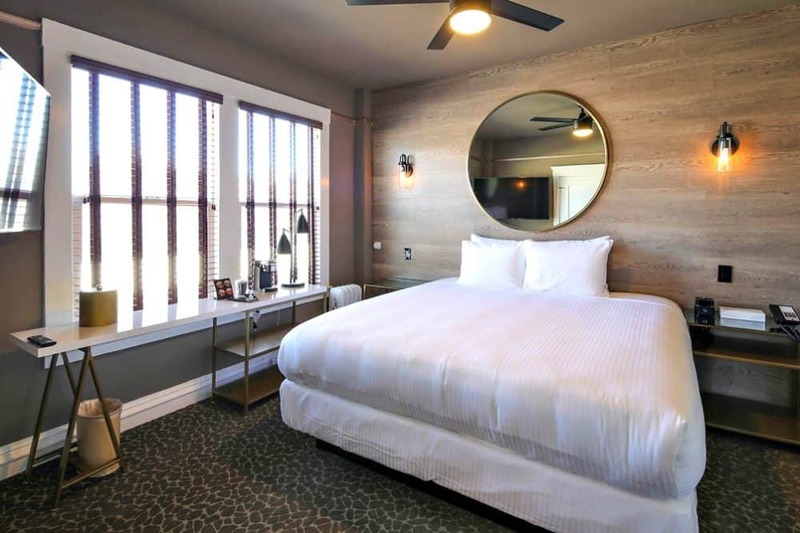 Located in the legendary Haslett Warehouse in Fisherman’s Wharf (only ais a 12-minute walk from Pier 39 and 0.5 miles from Alcatraz Island), this exceptionally rated chic 4-star boutique hotel in San Francisco has indeed cast itself in iconic terms. 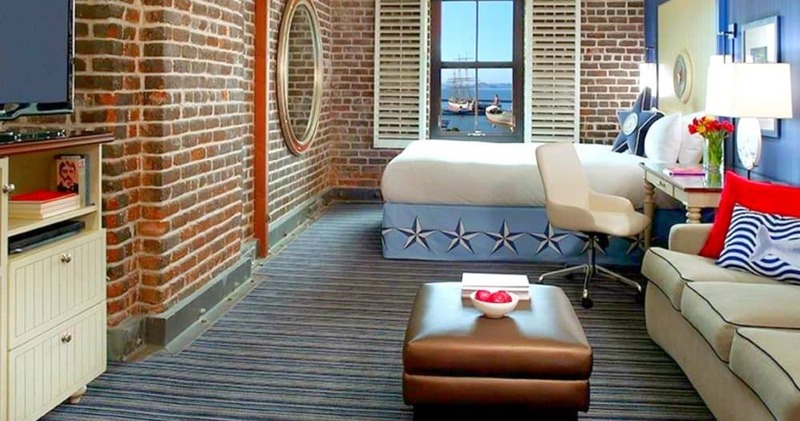 The Argonaut Hotel has topped many a best hotel list for years now and pays homage to the city’s Barbary Coast days with a tasteful nautical theme and ship paraphernalia galore. 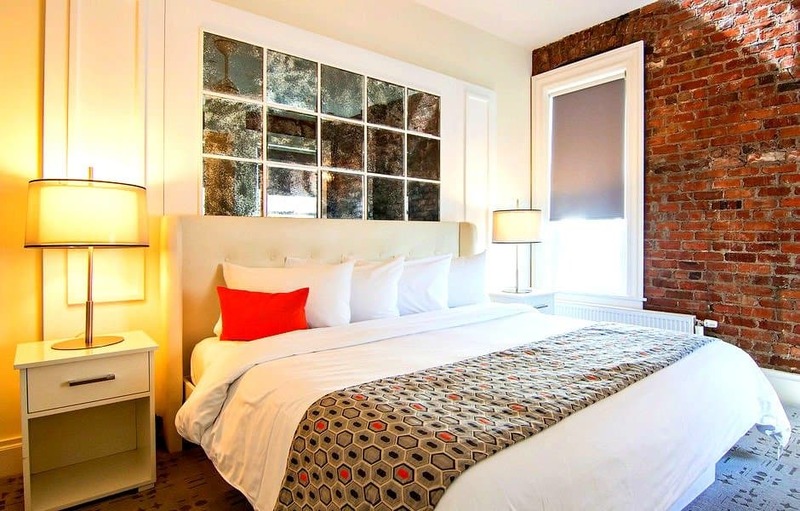 The exposed brick image nods to its pioneering past while the slick design celebrates the city’s eclectic vibe and even the porthole-shaped mirrors manage to remain tasteful. 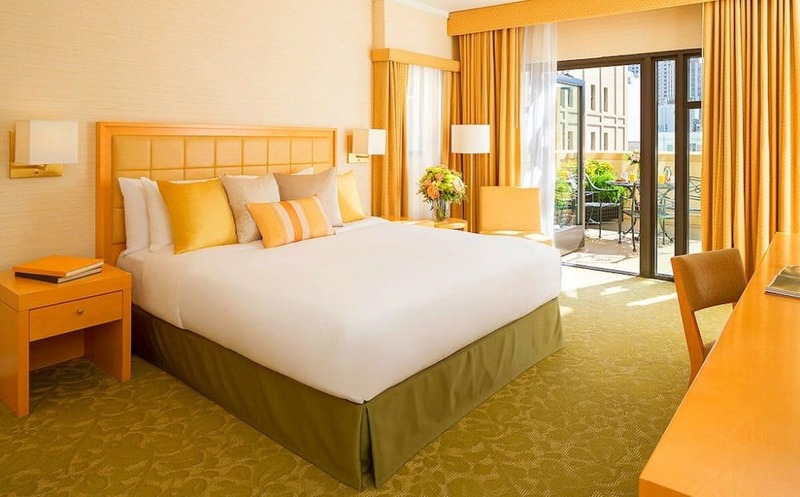 There’s also a careful attention to detail at this contemporary San Francisco stay with luxury linens, in-room spa treatments, yoga mats, and – in upgraded rooms –whirlpool tubs and sublime views of Golden Gate Bridge and San Francisco Bay. Throw in a superb spa, a complimentary wine reception, a seafood restaurant with terrace seating, eco-friendly credentials and pet-friendly attitudes and you have a hotel hero even Greek legend would consider worthy of the name! This is a fabulous budget boutique that makes a really good alternative to a hostel or a guest house. 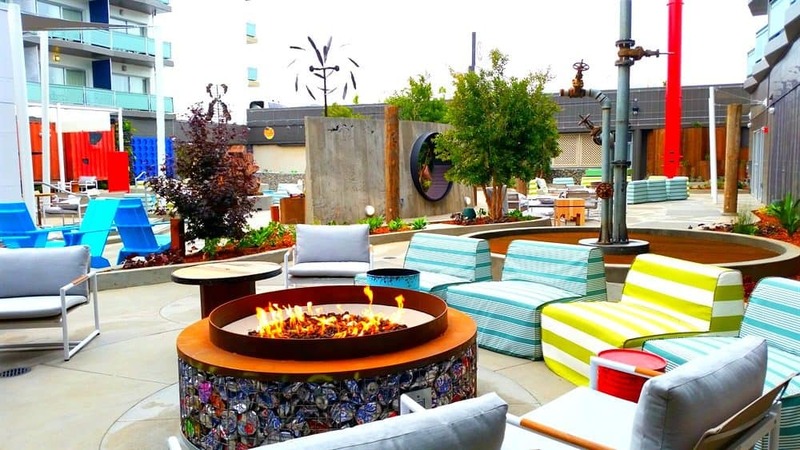 Located in the funky South of Market district only a block from the Civic Center BART station (which will easily connect you to the rest of the city), this eco-friendly hotel really knows how to be fun and stylish with lots of funky details and very distinctive furniture. Living up to its name, The Good Hotel claims to be one of the greenest hotels in the city – it’s furnished with reclaimed and recycled products and has bathrooms which feature water-conserving toilets. The rooms are hip and quirkily decorated with all sorts of fun features but being green is definitely still the name of the game! 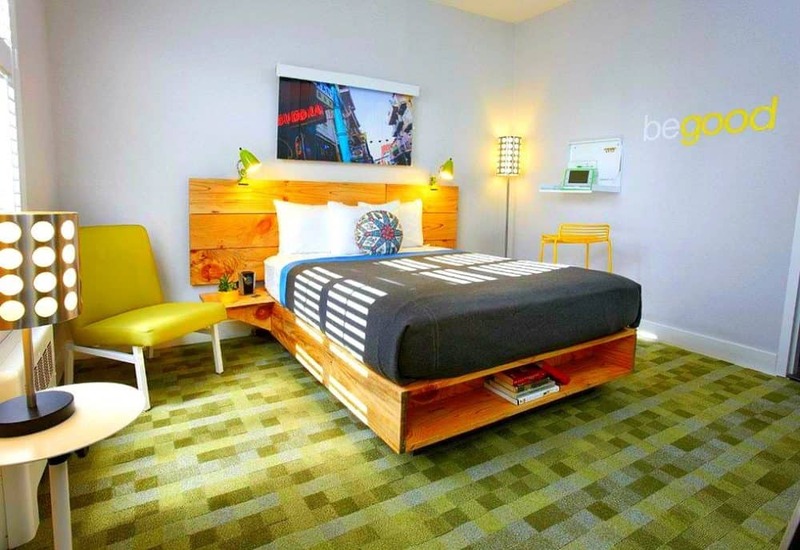 At this funky San Fran hotel expect blankets made from recycled water bottles, light shades made with recycled glass bottles, and even bed frames crafted from reclaimed wood. Other amenities include a cool photo booth, access to a fitness centre and a heated outdoor pool, complimentary bike use and if you have a hybrid car, you can park for free, nice! 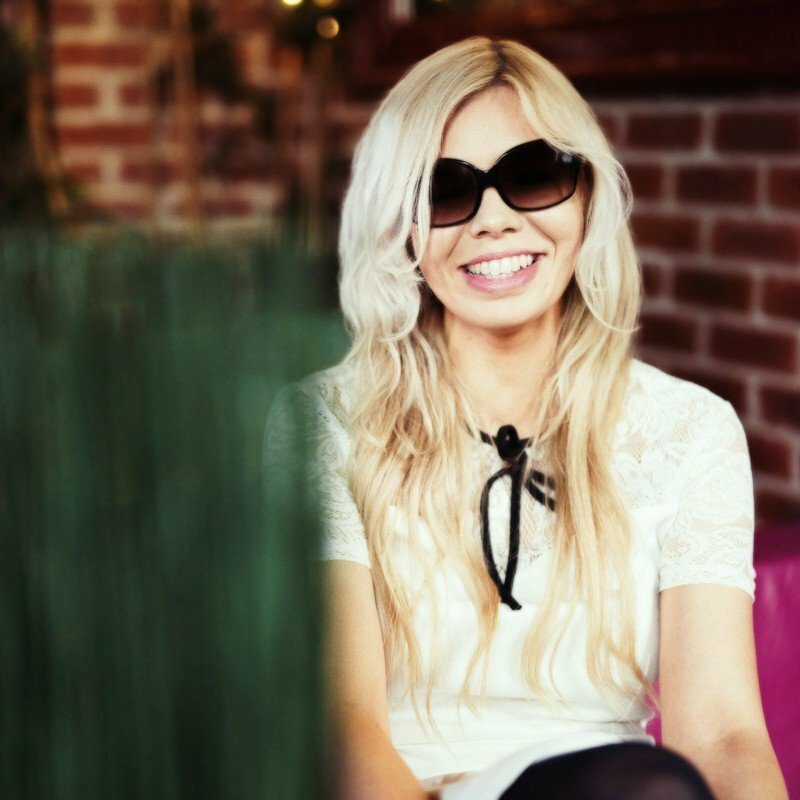 W Hotel – the place to be seen! Located in the dynamic SoMa district (the South of Market neighbourhood which is dotted with upscale dining options and high-energy nightclubs, only a four-minute walk to a Muni light-rail stop and a mile from San Francisco Bay), the fabulous 4-star exceptionally rated San Francisco version of the prestigious W chain is located deep in the heart of the city’s energy. The bright contemporary rooms at The W Hotel offer flat-screen TVs, minibars and Wi-Fi and upgraded rooms feature sitting areas and/or skyline or city views and they also offer everything from the unrivalled proximity to the trendiest locations to making bold statements of luxury and an eco-minded ethos – they serve up only sustainable cuisine in their sophisticated restaurant TRACE for example. At this wonderfully hip San Francisco hotel, also expect to make full use of their gorgeous luxe spa, a hip lounge, a fantastic nightclub-style cocktail bar which overlooks the restaurant, a have-to-be-seen to be believed sleek fitness centre which features a glass ceiling and their exclusive whatever/whenever service which offers the ultimate in indulgence and is tasked with taking care of guests every possible whim! Get ready to lose your heart to the W! 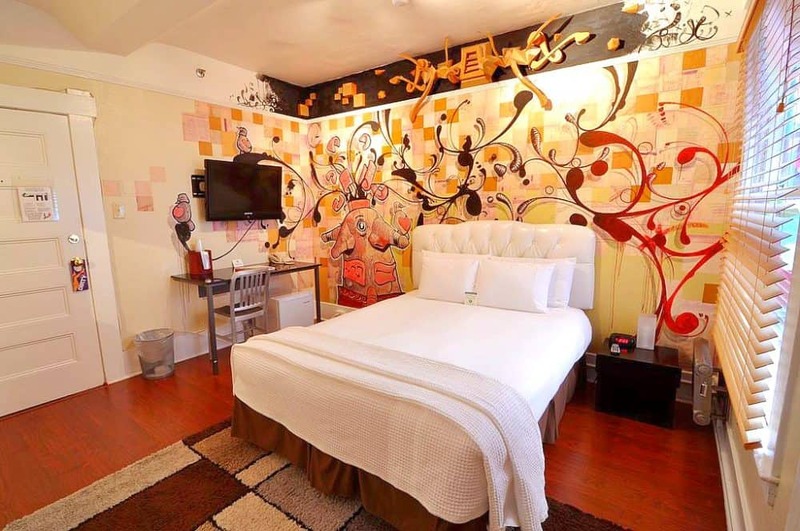 Part hotel, part art gallery, the reasonably priced but highly rated Hotel Des Arts dedicates itself to featuring the contemporary work of international artists. 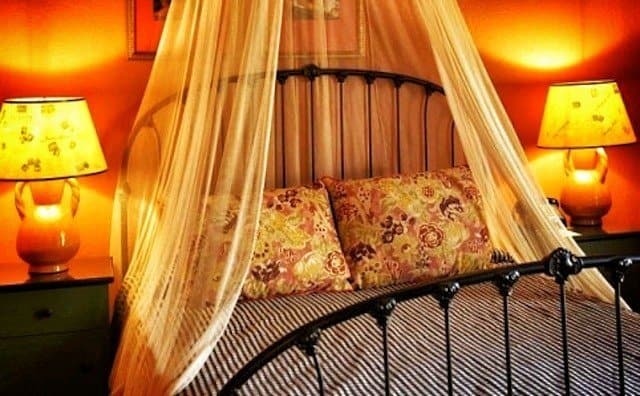 Located in the city’s creative French quarter which is chock full of galleries, cafes and restaurants (and only a 7-minute walk from Chinatown and an 8-minute walk from BART Montgomery Street Station), this fab down-to-earth boutique hotel promises comfortable modern interiors embellished with more than just a dash of visual stimulation! 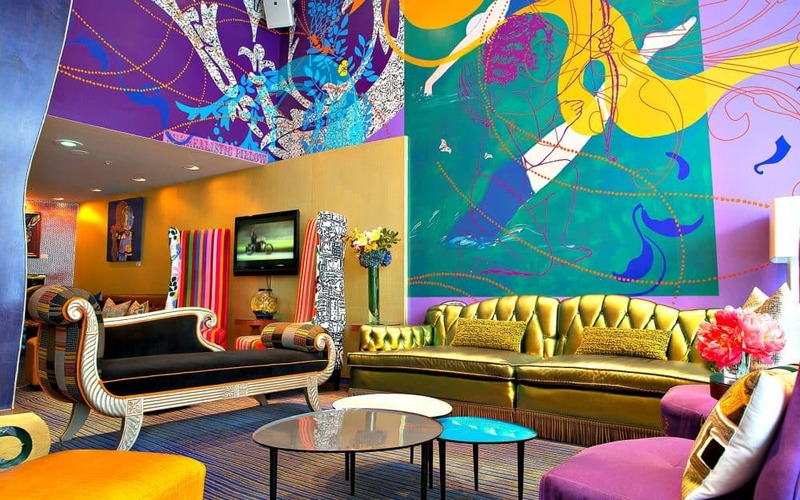 For the last year, some of the world’s top emerging artists have been allowed full artistic control over the design of the guest rooms and materials showcased in the decoration include wall-mounted vinyl records, graffiti, all manner of different fabrics and even three-dimensional artwork. 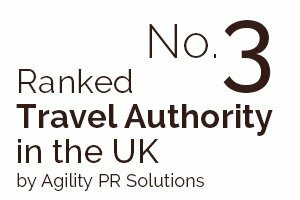 The result is a fabulously eclectic range of individually designed rooms which also come with free WiFi, flat-screen TVs, minifridges and microwaves. 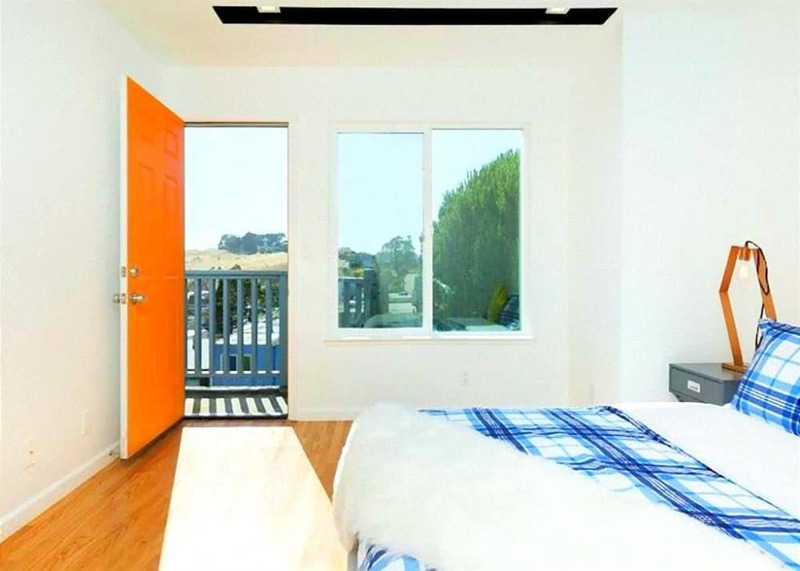 An affordable but hugely interesting funky accommodation experience in San Francisco which is not to be missed! 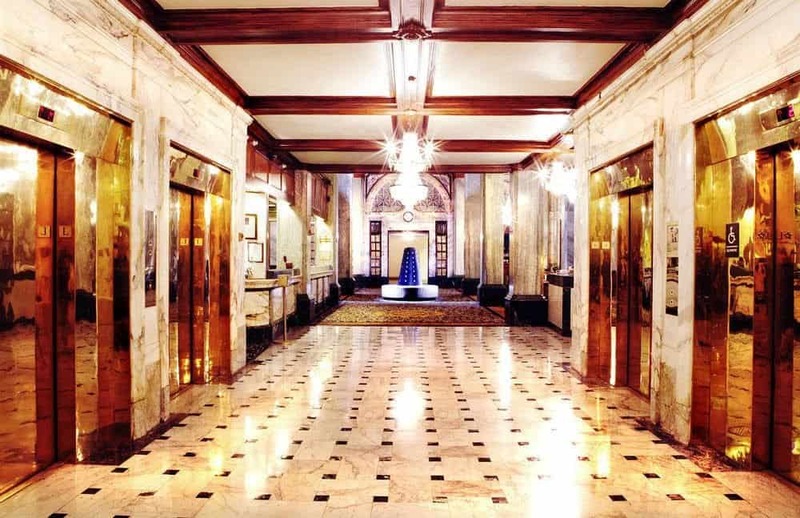 Since its inception in 1928, this 4-star highly rated hotel has been a landmark of opulence and glamour, welcoming through its doors many a celebrity and prominent public figure. 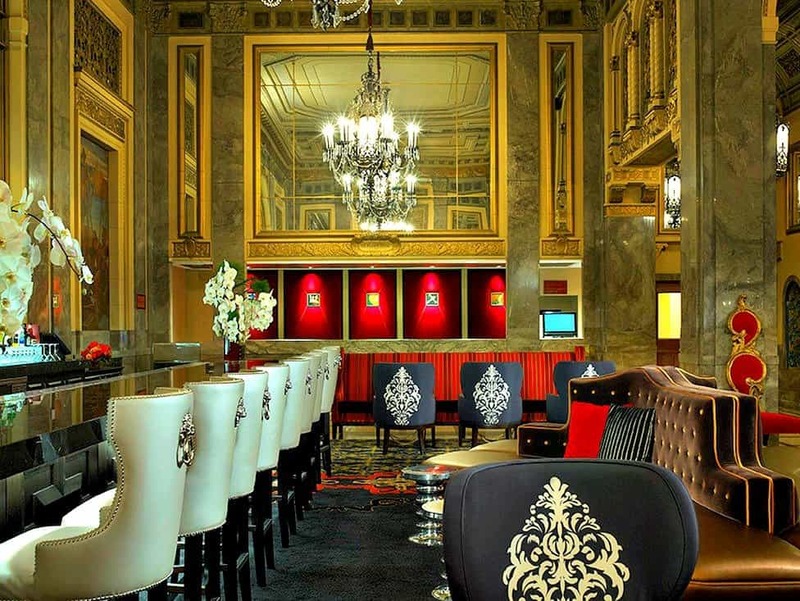 Today the Kimpton Sir Francis Drake Hotel it is a much-loved homage to the life of the city. Located in a suitably historic 1920s building just off Union Square in the beating heart of the city (only 2 miles from Fisherman’s Wharf), the hotel is rich in history and is continuing to trailblaze the best service, the most adventurous cocktails and probably the city’s longest-serving doorman at the hotel (who is now a national treasure)! 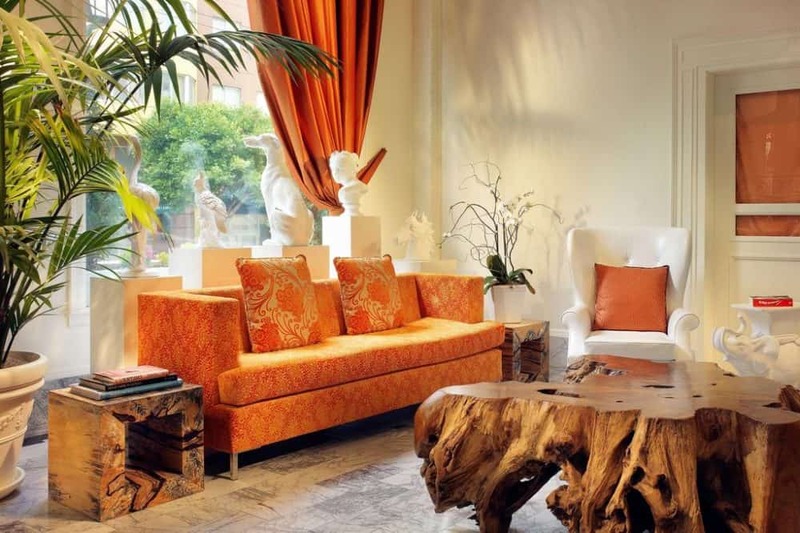 What a wonderful place this chic and contemporary San Francisco accommodation is – it made me just embrace the theatrical extravagance of the Californian city and I seriously loved it. From the divine cocktails and the free wine hour every afternoon to the regal rooms featuring flat-screens, Wi-Fi, iPod docks and in-room spa services to the 360° Views in the Starlight Bar and the hysterical Sunday Drag Brunch, I can’t think of a better place from which to experience this iconic city…! 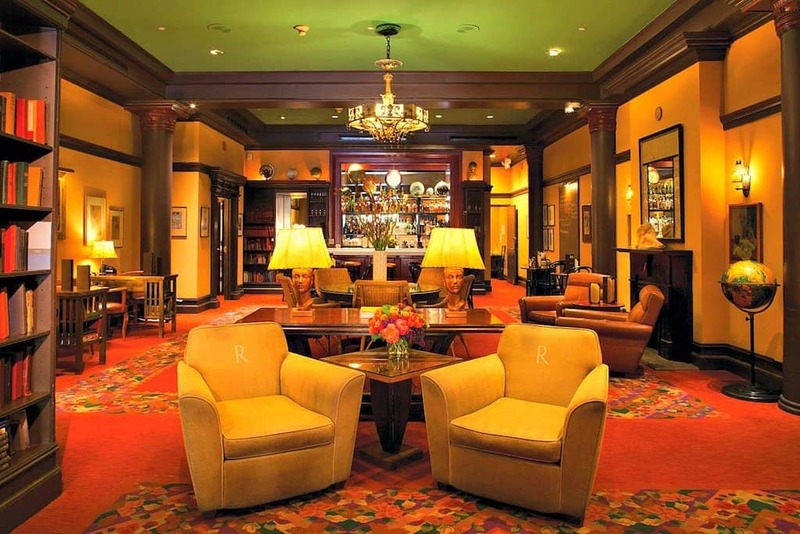 Hotel Whitcomb is the perfect blend of old-time elegance and contemporary facilities. The historic and chic San Francisco hotel once served as City Hall and as I walked off the streets into the beautiful turn of the century lobby complete with wood panelling, marble columns, Tiffany stained glass and crystal chandeliers and I instantly felt like I was on a set of a period drama! The original character of this historic building has been carefully maintained throughout the rooms and the communal areas and yet the feel is more distinctive than stuffy. Rooms also feature free Wi-Fi, desks and flat-screen TVs, suites offer a living room, dining area and wet bar and other hotel highlights include an Asian fusion restaurant, a coffee shop and a wine bar and an exercise room. Prices from $90 a night. Located in a central location only a 3-minute walk from Union Square (and a 2-minute walk from the Powell Street cable car stop) the highly rated and popular Mystic Hotel really embraces the famous San Franciso vibe with its cool blend of vintage and urban chic and thoughtful approach to space. All the rooms – which feature very cool brick exposed walls – are individually designed and mine was a wonderful mix of industrial edge and contemporary refinement finished off with luxurious bedding, all the usual mod cons and a big bay window which offered dramatic views of the city. The food, dreamt up by executive chef Luke Knox, was an innovative and delicious twist on classic west coast cuisine, used only local seasonal ingredients and was served up in the cool prohibition style Burritt Room and Tavern (which I loved)! 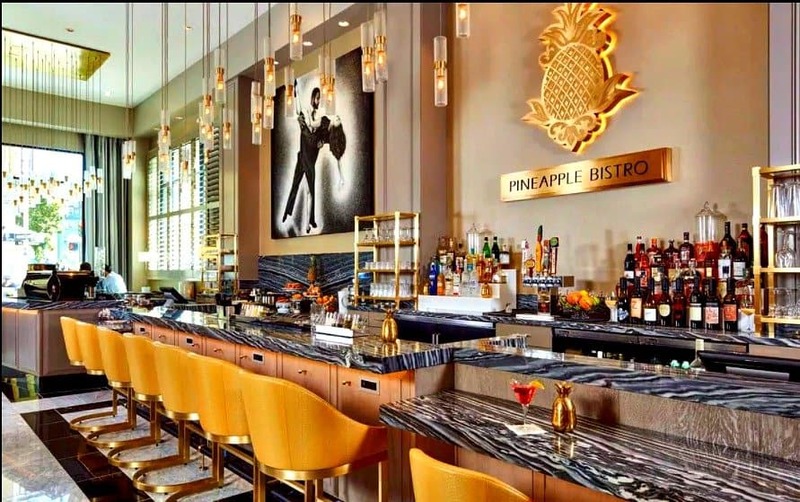 Other hotel highlights include a film noir-inspired bar which serves creative craft cocktails and a gorgeous lounge with leather sofas which features regular entertainment. A great unique hotel in San Francisco to absorb the city’s legendary bohemian attitude as well as soak up some of the city’s finest cocktails and incredible history! 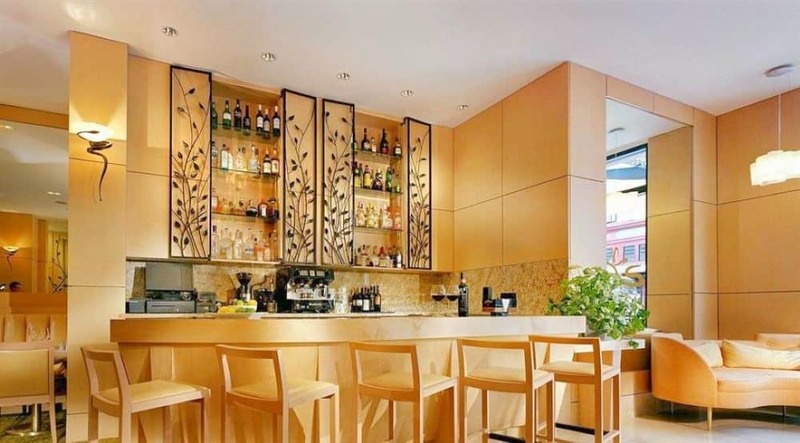 The highly rated Hotel Kabuki is a stylish blend of Eastern convenience and Western aesthetics and the owners have succeeded in creating something really unique! 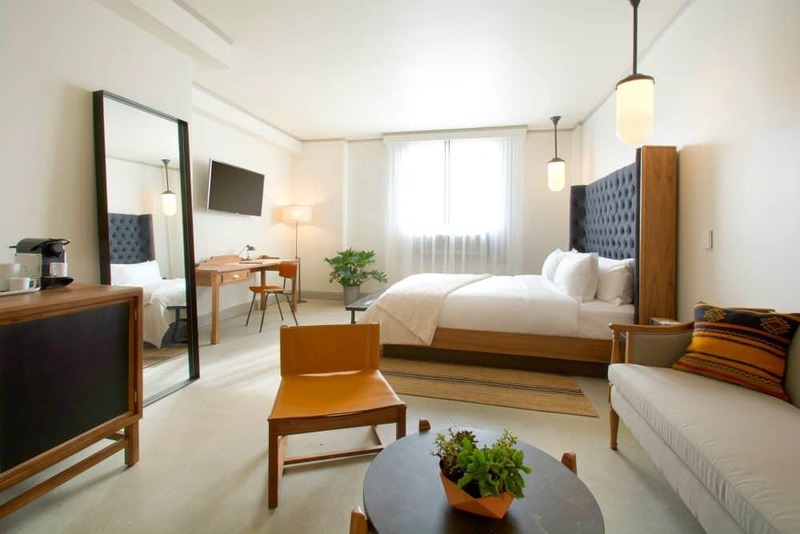 I was immediately hit by the tranquil atmosphere of the hotel despite it being just a mile away from central San Francisco (the hotel is set in Japantown, three blocks from the shops and restaurants of Fillmore Street and 1.2 miles from Union Square). The intriguingly decorated, Japanese-influenced rooms feature luxurious linens, flat screen TVs, and iPod docks and in-room spa treatments. Opt for an upgraded room and you’ll find gorgeous Japanese soaking tubs, balconies and/or whirlpool tubs. 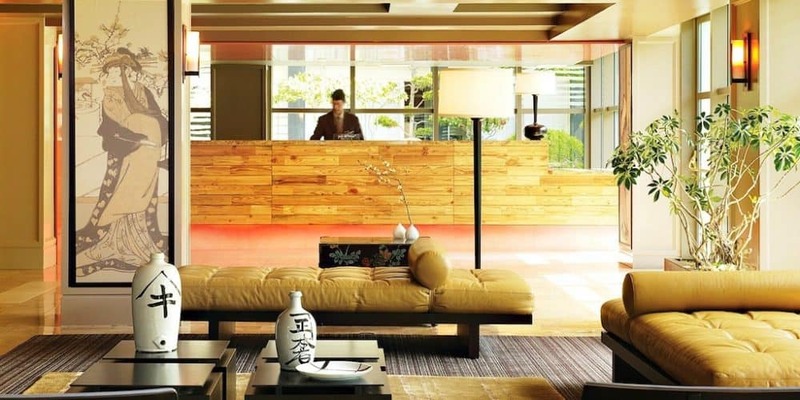 Other fabulous features at this unique and chic San Francisco hotel include free bathing passes to the nearby Kabuki Springs and Spa and a sleek lounge serving Japanese and American fare. The gorgeous décor combines Japanese prints and colours with lots of natural light and thoughtfully designed spaces for a truly authentic twist on a boutique hotel experience. I found I had plenty of time to contemplate life in the serene Japanese garden and soaking in the deep Japanese style bathtub and I left feeling thoroughly rejuvenated despite a rigorous itinerary of city sightseeing! Definitely a cool and unusual gem of a hotel. A prestigious Ascend Hotel Collection Member, the highly rated Hotel HTL 587 is your calling card for trendy! 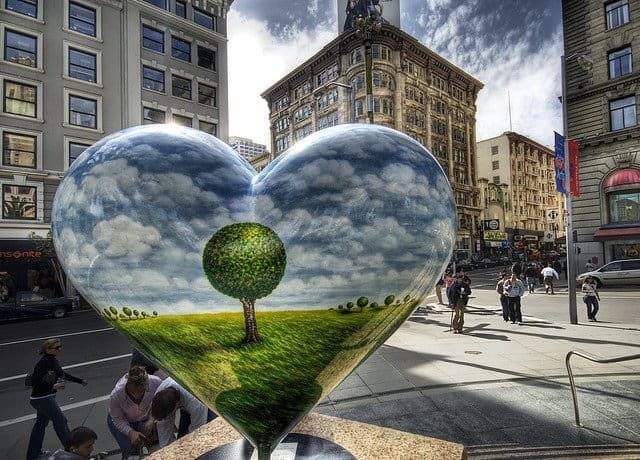 Located in the chic and funky Downtown Tenderloin area, nestled among the galleries, hip restaurants and cool bars, it is the perfect base for all those looking for a refuge from the vibrancy while still being part of the San Franciso legendary cool (it’s only a 7-minute walk to the UN Plaza BART station and a 15-minute walk to Union Square). The bright immaculate rooms mix a classic and contemporary style design with incredible city views and come with all the usual mod cons – free Wi-Fi, flat-screen TVs and even a virtual concierge – and downstairs you’ll find a laid-laid-back Vietnamese restaurant and a convenience store. 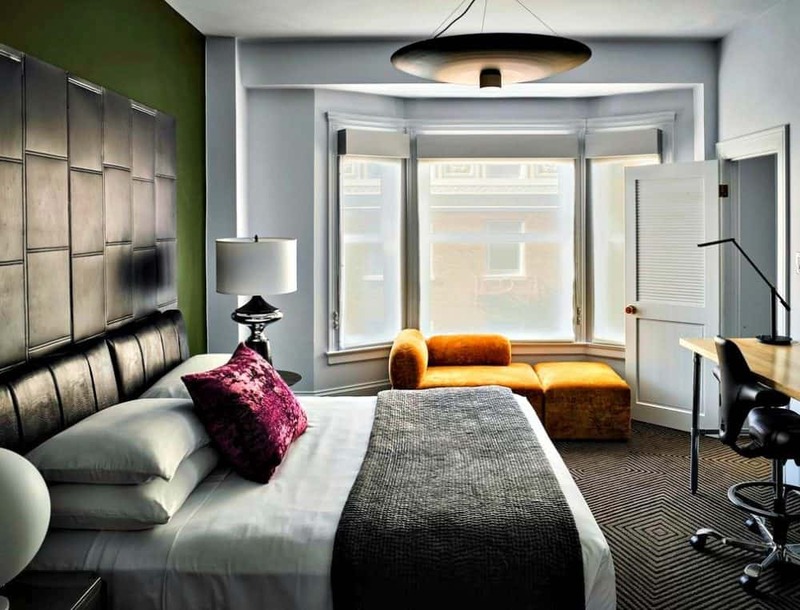 The cool and modern San Francisco hotel aims to ensure that guests receive comfort with a few quirky details and great service in a fabulously vibrant area in the heart of the city! Only a block away from Union Square (a 6-minute walk from Market Street and the Powell Street Metro station), and located in a space which has undergone major upheaval from the great earthquake of 1906 to extensive renovations over the past two centuries, the stylish and highly rated Hotel G is a testament to the tenacity of San Francisco. 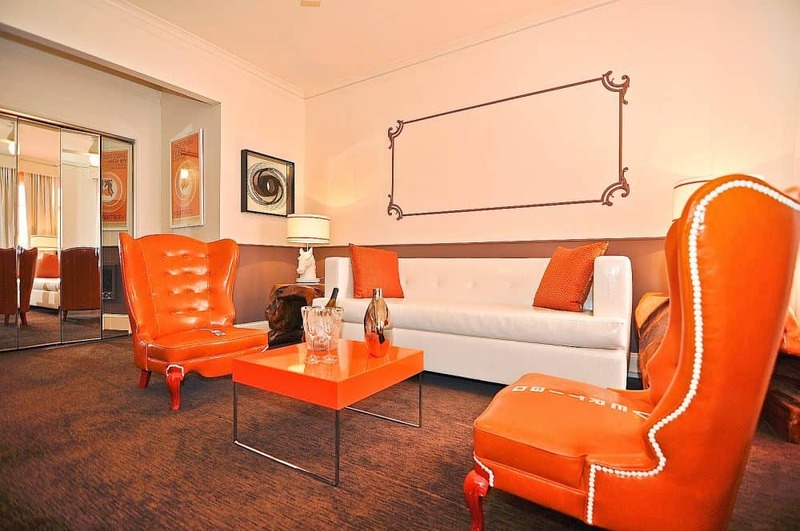 The history endured by this hip San Francisco stay is encapsulated in every element of its makeup. As you meander through the lobby, relax in the bar or chill out in your impeccably designed room, you will be able to hear the jazz of the past musicians and soak up the vibe of a bygone era, that has been so carefully embodied in the current style and charm of the hotel. The attractive modern minimalist rooms feature Nespresso machines, minibars, smart TVs and free Wi-Fi and other amenities include a relaxed Euro-American restaurant, a bar and a gym. 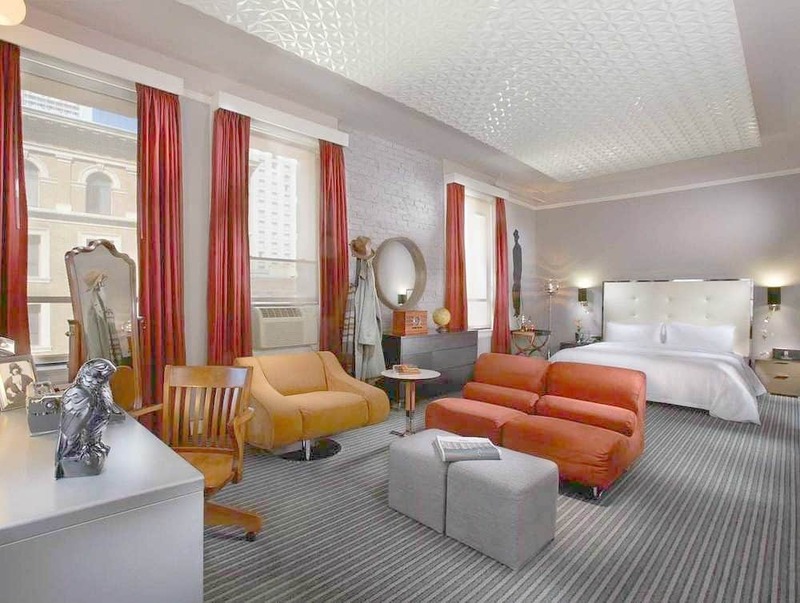 A great choice for an interesting boutique hotel located right in the beating heart of San Francisco. The highly rated Sparta 2A apartment offers a departure from the frenzy of San Francisco where luxury and contemporary whimsy become reality. 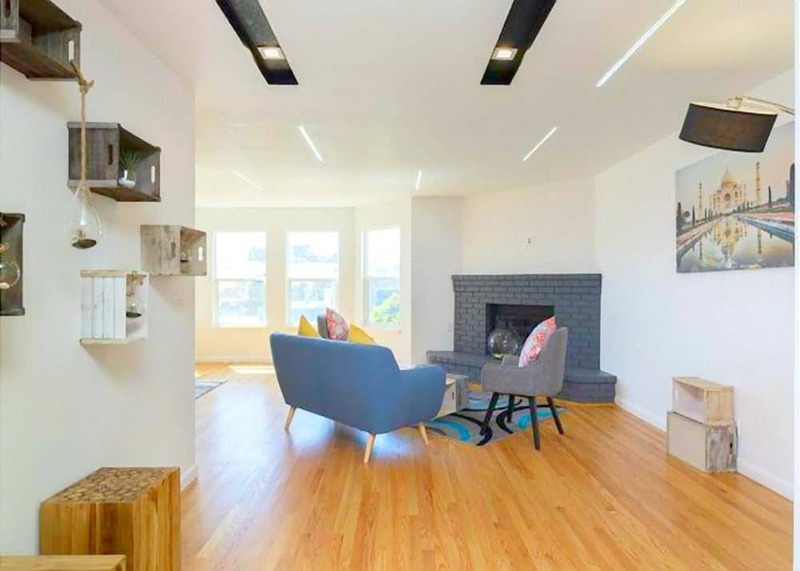 This light and airy modern San Francisco abode is a place where you can make home during your holiday and explore at your own pace knowing that a relaxing environment nestled away from the hustle and bustle awaits you. Located 5 miles from Union Square, not only does it offer respite from the craziness of the city but the floor-to-ceiling windows provide guests with unparalleled views of the city and that bay that Otis Redding was so entranced by. As well as three bedrooms, a fully fitted kitchen (with a dishwasher and oven), modern decor and free WiFi the apartments offer a home-away-from-home ambience! Lovely! This highly rated unique San Francisco boutique hotel boasts a very intriguing past, the building (which is located in the posh Nob Hill area only a 9-minute walk from Union Square and a short walk from several light-rail stops) was once a Prohibition-era speakeasy and then the setting for the Alfred Hitchcock’s classic film Vertigo – yes seriously! With a hip new revamp and a name change, the fabulous Hitchcock inspired ‘Hotel Vertigo‘ was born. With the mysterious movie theme running throughout the hotel you can also expect to find leather wing-back chairs, horsehead bedside lamps and Vertigo branded bathrobes creating a wonderful film set experience. Contrasting the classic decor is sophisticated in-room technology which includes a flat-screen HD TVs, iPod docking station, and free Wi-Fi. Definitely one for the film buffs! Reflecting the city’s progressive ideals is this ultra-green, modern and highly rated 4-star boutique hotel. The Orchard Garden Hotel is only one of four hotels in the world to win the LEED (Leadership in Energy & Environmental Design) certification – meaning it adheres to the strictest of environmental standards. Both luxurious and popular, the hotel was built with sustainably harvested wood and recycled materials, boasts chemical-free products (including all the products used to clean with), energy-saving rooms and a restaurant which only uses organic and locally sourced ingredients. 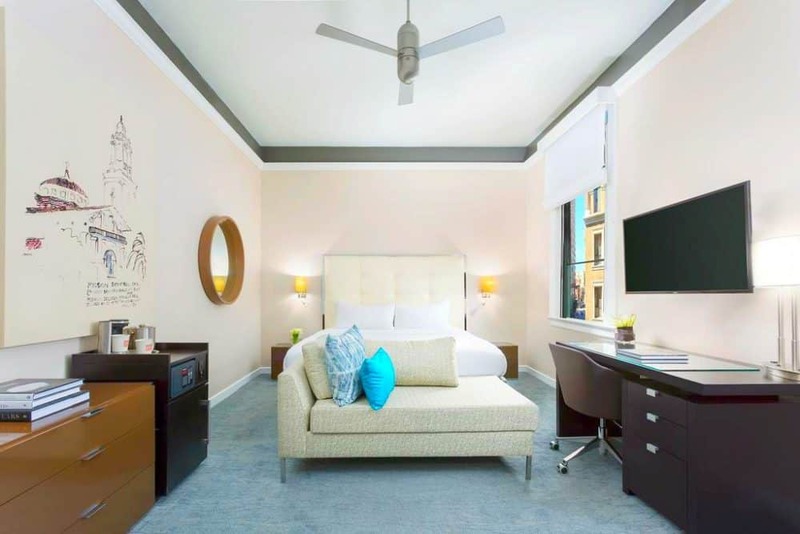 Located in the Financial District only a 6-minute walk to the shops of Union Square and two blocks from the Powell Street cable-car line, other highlights at this chic San Francisco hotel include spacious rooms with free WiFi, flat-screen TVs and Egyptian cotton linens, a state-of-the-art fitness centre and a delightful rooftop garden. A stylish hotel with a heart and a conscience, very rare indeed! Housed in a stately, 100-year-old building right on Geary Boulevard and close to everything I wanted to see in the city (only an 8-minute walk to central Union Square and a short distance to Chinatown) this little ray of sunshine was a real pleasure to stay in! Super friendly staff and comfy luxe rooms with a wonderfully quirky yellow pineapple theme that made it impossible not to feel happy at the 4-star exceptionally rated Staypineapple...I mean who can seriously feel glum wrapped in a yellow gingham bathrobe gazing out at fabulous views of San Francisco? The rooms had a very high standard of décor which was bright, cheerful and a touch kitschy with all the mod cons I needed including free WiFi, Bluetooth/iPhone dock, Signature bathrobes, and a very swish marble bathroom complete with a walk-in rainfall shower. The communal areas were equally as warm and welcoming and I enjoyed a glass of Californian wine (okay maybe two!) in the bar as well. 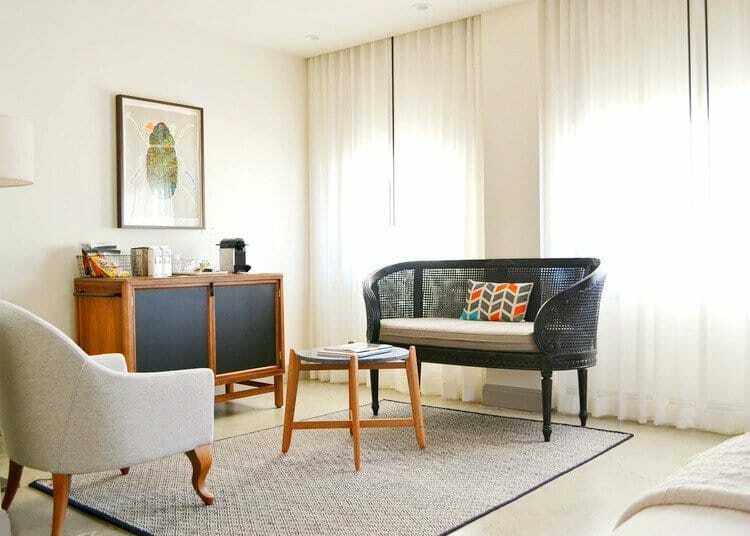 Other great features at this hip San Francisco stay included an exercise room, loaner bikes and available dog beds, water bowls and pet treats – aww! No detail is forgotten here, just a joyful place to stay! 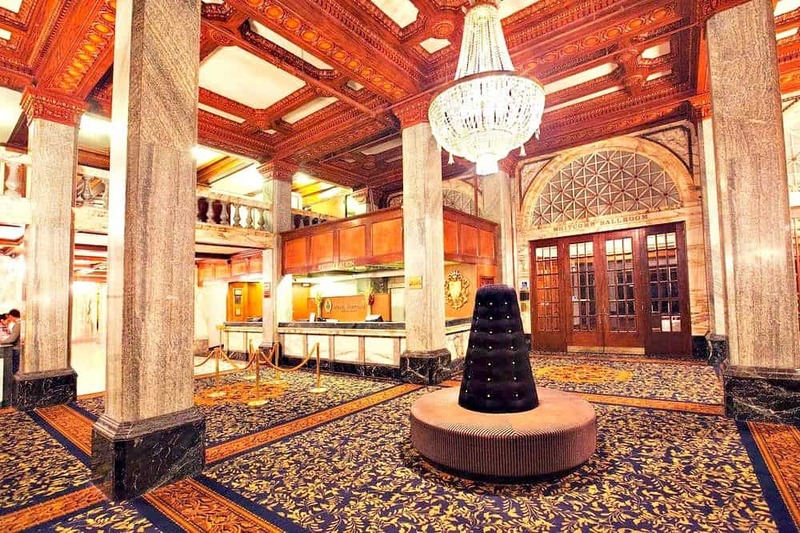 Built a hundred years ago, in the heart of the city (a 5-minute walk from central Union Square), to accommodate the influx of travellers into the city, the façade of this cool San Fran hotel has seen it all. Like so much of San Francisco, the highly rated Hotel Union Square has wrapped its being up in the history of the city. Its fabulous Art Deco style is infused with the eclecticism which the city is famous for and the chic rooms offer free Wi-Fi, flat-screen TVs and an attractive classic modern decor. 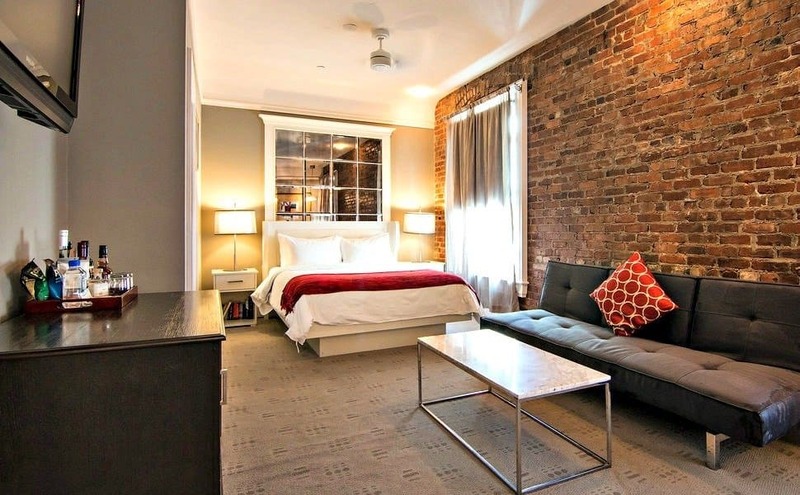 Upgraded rooms also add in iPod docks, rainfall showerheads and soaking tubs and suites feature funky exposed brick walls. Other stand out features include sociable evening wine receptions accompanied by live music, and use of a nearby gym. 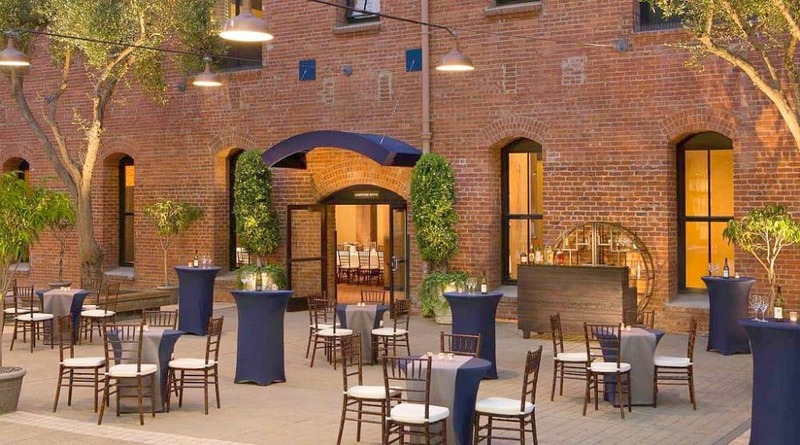 It’s a hotel with a reputation steeped in its commitment to tradition and celebration of the city’s past and this coupled with its fabulous modern day amenities means it’s a great choice for a centrally located unique boutique hotel in this wonderful Californian city! 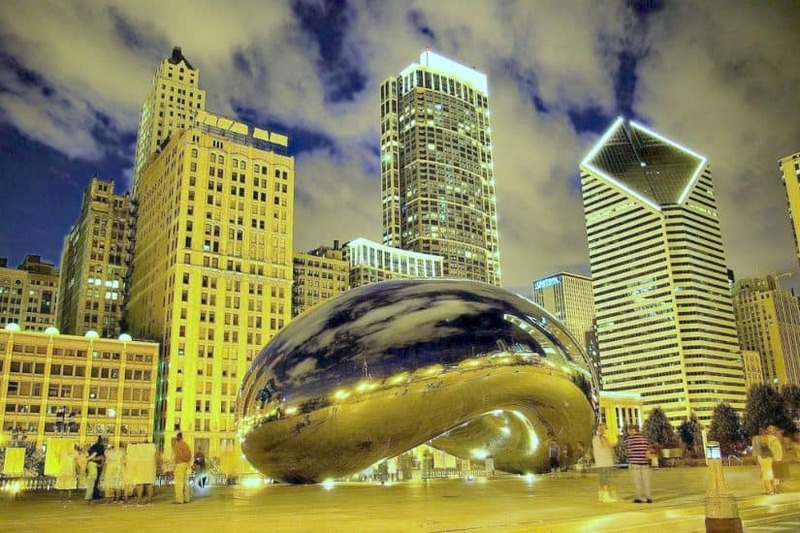 If you liked our collection of cool and unusual hotels in San Francisco, we also have posts on cool hotels in Portland, cool hotels in Los Angeles, and quirky hotels in New York. Thanks for posting. 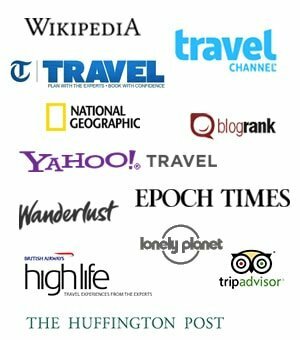 This is great list for unique places to stay in the city. Love visiting the bay area! One of our favorite hotels to relax near San Francisco is Cavallo Point. It’s right next to the Golden Gate Bridge so the views are stunning. We loved it there too! I can recommend the Hotel Rex. I stayed there recently after four weeks in corporate hotels in Singapore, Los Angles and Boston. This place was a breathe of fresh air. Great customer service and the wine was a welcome beverage after a long day sightseeing. And the bar is full of local people who will eagerly ask you to join them for a drink and a chat. I have fortunately had the opportunity to go to San Francisco some years ago with my family. I never actually stayed in the city, as it was a day trip (I was actually staying in San Jose). Checking out these hotels really reminds me of the culture of the place, though. 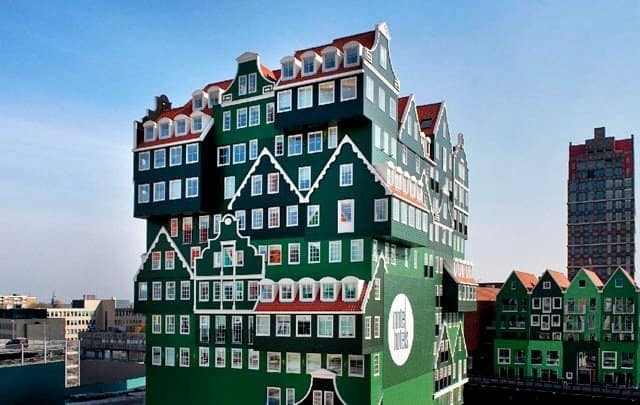 These hotels are cool because they are all so different from each other. 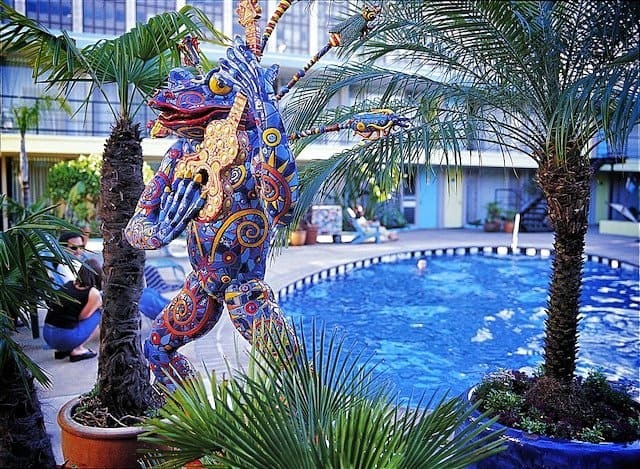 The Pheonix hotel looks particularly cool, though I may be biased because that frog playing a guitar statue is just sort of epic! I like Hotel Tomo, this is really unique and interesting. It is also affordable. This is a nice article! I like the sound of The Orchard Garden Hotel, especially the chemical free products. Hotel Diva looks good. Like the prices! I’m surprised how low the prices are for some of these hotels. Great info!